Chilaquiles with Avocado - my take on fresh healthier chilaquiles. Made with corn tortillas, eggs and red chile salsa. A favorite for breakfast or brunch. Gluten free. Today’s recipe is something I really love to make at home because it tends to be a little too greasy for me at restaurants. 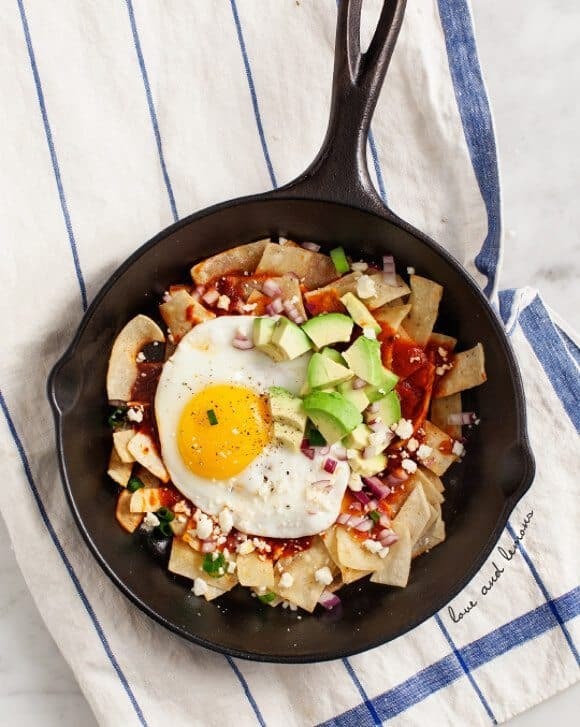 Chilaquiles are usually considered hangover food and it all starts with frying tortillas in a skillet. Of course, I went a little (a lot) lighter on the oil so they toast in the skillet and crisp up without becoming an oily mess. This way, we reserve a few extra calories for that brunch-time margarita! Remember this chile salsa from a few weeks ago? Here’s another way to use it… this meal comes together really quickly if you have some on hand in your fridge. (If not, see below for other sauce suggestions). This is perfect topped with fried eggs, but it would be equally delicious with black beans if you’re vegan. Heat oil in a medium skillet. Add tortilla strips and a few pinches of salt. Lightly fry/toast strips until the edges become browned and crispy. (Flip a few times so both sides cook). Pour the chile sauce into the center of the skillet to coat the tortillas. (I like to leave the tortillas that are a few inches from the edges un-sauced so they remain a bit crispy). Let the sauce sizzle in the skillet with the tortillas for a few minutes while you fry your eggs. (turn heat down or off if you’re skillet is getting too hot). 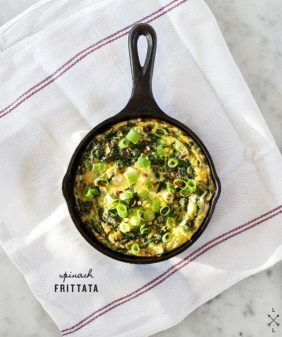 Fry eggs and add to the skillet along with scallions, red onion, avocado, and cheese. Add a squeeze of lime, and more salt, to taste. Side note – I find that the Whole Foods brand corn tortillas crisp perfectly without being fried (they’re thin and a bit more dry than others)… I’ve done a lot of tortilla testing and those are my favorite for crisping in the skillet (or baking in the oven). I store them in my freezer. This looks amazing! I will have to make it soon. I dont know much about growing avocados, but my grandma has a tree and they are soo delicious. I think you can start growing a tree from the pit In a windowsill or something. Thanks for the recipe! also Highly recommend you buy hass seedlings fomr a nursery so you get the right rootstock and the friut you want. Chilaquiles is one of my favorite meals! I have everything to make this on hand… maybe this will be dinner! Eggs for dinner are the best 🙂 Let me know if you give it a try! This looks delicious! I can’t wait to try making it!! Thank you for sharing! 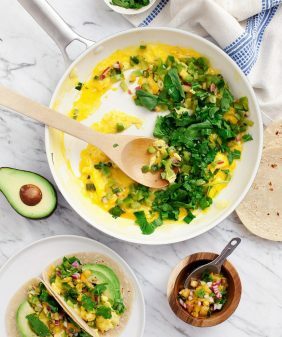 Hey, there’s nothing wrong with plenty of avocado! 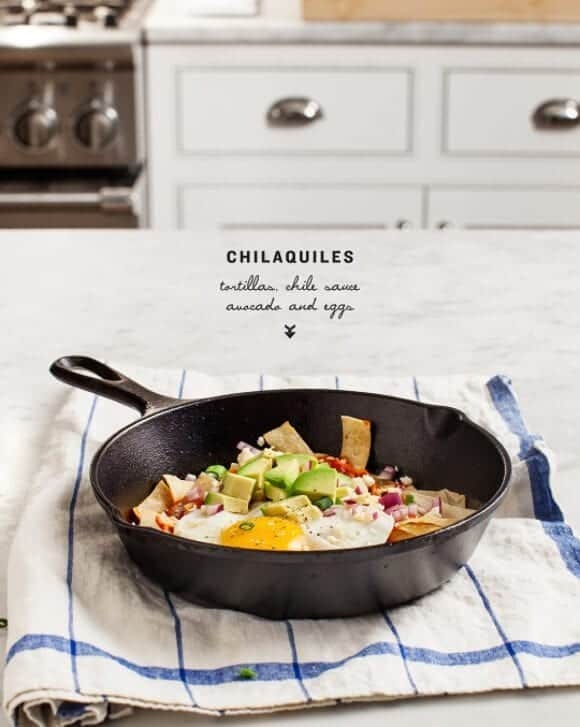 These chilaquiles sound wonderful for a weekend breakfast. chilaquiles is my new word of the week – and daaaaaang I want it in my body so bad! Chilaquiles are delicious. If you’re ever in San Francisco, try the chilaquiles from Mijita’s at the Ferry Building. I’m Mexican and I think they serve THE best chilaquiles ever! Way better than my mom’s! I’ll be sure to go there next time, thanks! Chiliquiles with an egg on top are so freakin good. And I think that we’d all be happy even if all you did was post avocado recipes. Woah. Growing avocados – I never thought how convenient that would be. I wonder how difficult the process is? I presume you’d keep them inside. Curious to hear about this if you decide to do it! I’ll keep you posted :). I’m thinking I’ll have to keep it in a pot that I can move in and out – we live in a warm climate, but it gets too hot (and too cold) from what I’ve read is ideal. Avocados are definitely a beautiful ingredient! 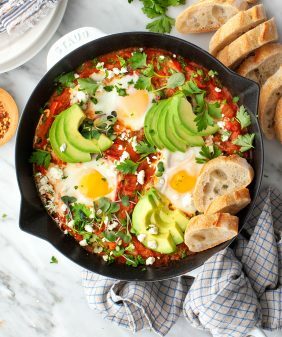 I’m with you that chilaquiles can be too greasy and just heavy — great idea to toast the tortillas instead of frying them! And, yes, to the avocado tree! I’m sure you’ll have a green thumb in no time. I use the Whole Foods brand corn tortillas to make my own tortilla chips/tostadas in the oven. I use spray a little olive oil on them and sprinkle with salt. They bake up nice and crispy – better than the other brands I’ve tried. agreed – they’re a little bit dry (I don’t love them for tacos or anything else) but they crisp so perfectly! I love a good batch of spicy chilaquiles! They are a typical breakfast food down here, and are SO good. Chilaquiles verde would be yummy too. You could make a n avocado chile sauce. ooh yes definitely – I can hardly wait for summer & tomatillo season! I’ll probably plant a small tree that’s already sprouted… you know, to save some time! I had this dish (hung over!) for brunch last year at a restaurant, but it was super greasy. I can’t wait to try this at home, thanks for the delish recipe! I loooooove chilaquiles!!!! I agree, sometimes they are way too greasy! I wanna throw in some soyrizo to this mix too for some extra protein! What a yummy-looking meal! I love avocado too. It’s so good for many dishes. Sometimes I just eat it along with breakfast without any alteration. 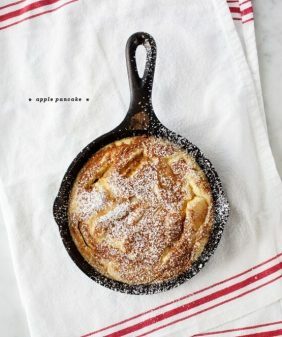 What a wonderful simple and delicious looking recipe. 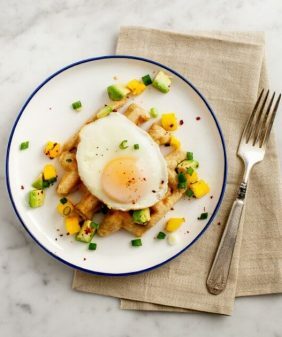 Perfect for breakfast, or dinner…. i love chilaquiles alot esp for brunch. I have found that corn tortillas can be broiled for few minutes in the oven to get the crisp texture, although you need to be little bit more careful. Looks delicious! You really can’t go wrong with a recipe that includes avocados, I also love the idea of a brunch-time margarita! I have a black thumb…I tried to grow cilantro on 2 occasions and it hasn’t worked out yet. I am hoping third time is a charm! 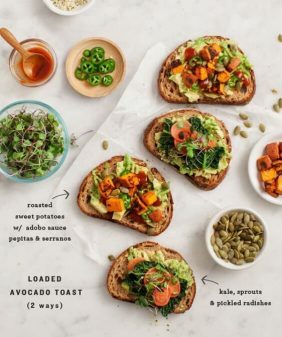 Good luck on your Avo tree…that would sure save some money 🙂 These look delicious! I can’t wait to try them. Cilantro is hard! I’ve been pretty successful with most herbs (and what I mean by that is that they have grown on their own, no help from me :)… my cilantro has always flowered over. That looks awesome! Ive been growing my avocado tree for about 2 yrs and its about 5 ft tall. This was the 1 seed out of a sozen that decided to grow. We live in Missouri so I keep it inside at all times. Hello Jeanine, I’ve been reading your blog since forever, but this is my first time commenting. I live in Lille (France), where there is no such thing as Mexican or Texan cuisine, except for a few highly processed sauces and tortillas. A friend of mine visited from Austin a while ago, and brought me bags of dried chiles, which I had no idea how to use (as I’ve never really eaten Mexican food, not even in a restaurant). Then I made your dried chile salsa, and LOVED it. I wanted to taste it the moment I made it, and spread some on a slice of bread, and topped it with fresh goat cheese. It was delicious. Then for breakfast, I made your recipe for chilaquiles (using my own home-made corn tortillas, adding sliced radishes on top for some crunch, and substituting the cotija cheese – can’t be found here – with feta). It was truly delicious! Even my difficult boyfriend loved it. So much flavor, and so unusual to my French palate. I’ve still got piles of dried chiles in my cupboard, so I’ll definitely be making those two recipes again. Thank you, thank you! Thanks, this is the best compliment ever!